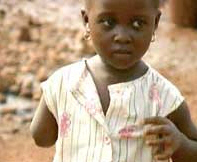 Many of the top cocoa-producing nations in West Africa continue to allow slavery, epecially in the agricultural sector. In all of these nations, slavery is officially illegal, but it is still often practiced, and enforcement of the law is limited. Real life on a Wes t African cocoa plantation is a far cry from the rosy picture painted by the Chocolate Manufacturing Association. The truth of the West African slave trade and the complicity of chocolate producers is beginning to emerge. In many chocolate-producing West African nations, and espcially the Ivory Coast, slaves (mostly children) are used on cocoa plantations. Every year, thousands of Malian children are sold into slavery and brought into the Ivory Coast to work Unfortunately, the plantations involved are small enough and isolated enough that this practice remains under the radar of law-enforcement officials. The tragic stories of the children involved came to light when Knight Ridder newspapers published a series on these slaves. In response to these allegations, the government of the Ivory Coast has tentatively agreed to form a task force to mitigate the problem. Chocolate manufacturers insist that they have little control over their supply chain. However, there are other alternatives available. Buying fair trade chocolate ensures that small cocoa farmers are paid adequately for their products. The next time you bite into a chocolate bar, consider the impact of the chocolate industry on African children.